"A must have for Fruit Ninja and Angry Birds fans!" TRY THE LATEST POPULAR SWIPE AND CUT GAME! Players all around the world are enjoying Swipe Zombie Birds! It's fun, addicting, and easy to play! Kids and adults love it! Fun HD graphics, music, and sound effects. The simple yet satisfying gameplay of Swipe Zombie Birds is ready for some action! 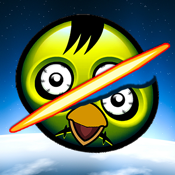 Simply use your finger to swipe the screen to slash and cut the zombie birds! Be careful not to let three birds get away or you will have to start all over again. Beware the bombs too! Get the high score and challenge your friends! Make it to the next level and see how far you can get! Various zombie birds with varying speeds throughout each level. You can also take a screenshot and post your results to Facebook. Enjoy Swipe Zombie Birds!!! Fun for all Angry Birds and Fruit Ninja fans! Supports all versions of iPhone, iPad, and iPod Touch.